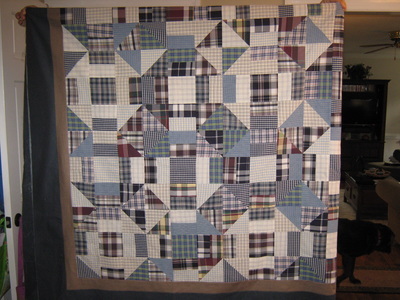 Classic t-shirt quilts are made in a grid patttern using t-shirts cut to 13 inch squares. These are put together with fabric sashing and small squares of fabric (cornerstones) in between. One or two borders can be used. Take a look at my Gallery page to see more examples of my work. The shirts are cut to different sizes and put together with sashing around each . Feel free to include favorite articles of clothing. This makes for a truly one of a kind, custom quilt. Prices start at $400 plus $10 per t-shirt. Take a look at my gallery page to see more example of my work. Make sure to wash all of your t-shirts (even new ones). Do not use a dryer sheet. Mark the logos on your shirts that you want used with blue painters tape (do not put directly on the logo). Also specify if you have a favorite that you would like placed in the center. T-shirts, mesh shirts, sweatshirts, cotton dress and golf shirts, badges, aprons, handkerchiefs and bathing suits all work well. Number of shirts for classic t-shirt quilt: wall-hanging 4, baby 9, throw 16, twin 20, full 25, queen 30, and king 36. Typical quilt sizes- wall hanging 30 in. sq, baby 36x48 in, throw 66 in. sq, twin 70x80 in, full 84x84 in. sq, queen 84x97 in, king 96 in. sq. Custom sizes are available. We can discuss fabric choices for sashing, borders and backing. Refer to the quilt gallery to see some of my completed work. Custom embroidery available for $1.00 per letter. To get started - Contact me. Complete the Order Form/Customer Agreement, and send with a deposit of $200. Shipping and insurance will be calculated according to the weight of your order. Upon completion of your quilt I will contact you with your final balance. Once balance is received your order will be shipped. 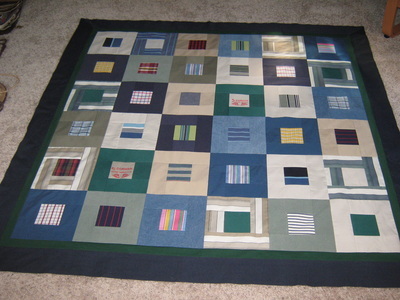 Memory quilts can be made from almost all kinds of clothing. They are a great way to preserve the memories of your children and loved ones. 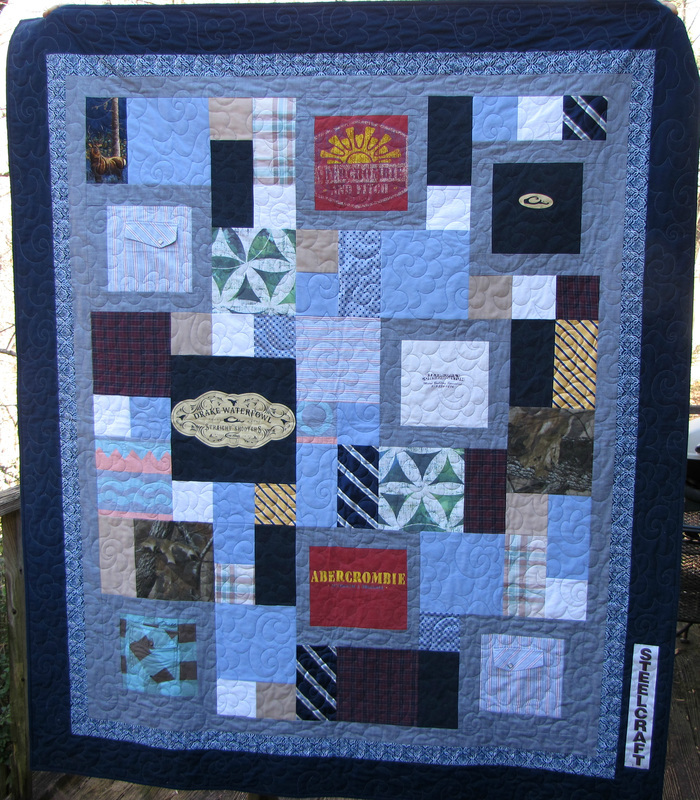 I make either Traditional Pattern or Custom Memory Quilts. 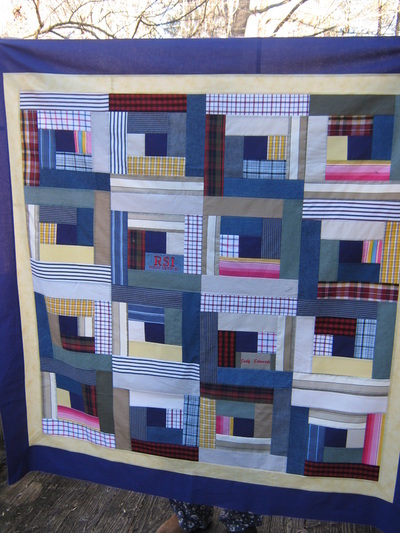 Traditional Patterns include Log Cabin, Square in a Square, Churn Dash, and Rail Fence. See more examples on my gallery page. Custom patterns are specialized for you. For additional interesting pattern choices check out my boards on Pinterest. Almost all clothing works for a memory quilt except leather, heavy jackets, loose knits, minky fabric and velvet. Wash clothing if appropriate, but sometimes the stains and wear make the quilts more personal. See quilt sizes above; custom sizes can be made. We can discuss a pattern or make your quilt totally custom. We can discuss fabric choices for block accents, borders and backing. To get started- Contact me . Complete the Order Form/Customer Agreement, and send with a deposit of $200. Once balance is received your quilt will be shipped.